As we brought the Swiss amp closer to the production of the Beatles models, it brought back previous discussions and ideas. One of these was a feeling that the accepted history of the Beatles amps – that they were given three prototype amps, which they used in studio and on tour – might be wrong. There was no conclusive evidence, just a feeling of doubt from looking at blurry photos from different angles – but a suspicion or gut-feeling remained that they might have had a fourth amp at least. There was another thing we couldn’t resolve too. We couldn’t tell with the photos we had, but we started to get the sense that one of the Beatles amps might also have had a skewed/re-drilled Amphenol power connector. If this was true, it would be possible that the Beatles ones might have had Amphenols thinly attached over a Bulgin hole too, just like this Swiss one. We just couldn’t say for sure though – it could be the reflection of lights playing tricks, or the angle. To try to work these problems out, we reached out to the team at Adams Media. 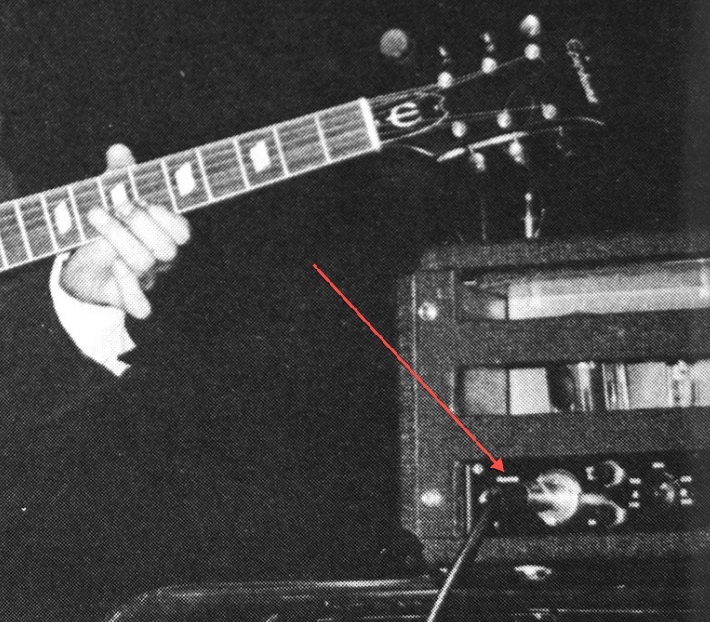 We wanted to see if there was any chance of getting a closer view of a section from a photo of the Beatles 1966 tour in Germany, which showed the back of an amp. When we got a response later, we were blown away by the help they offered us. They’d gone to quite extraordinary lengths to help, crafting beautiful images for us direct from the originals, at high resolution. They showed blow-ups of the panel section in astonishing detail – especially one photo with Mal looming over an amp as he put equipment on the stage. They would totally change our thinking… and lead to an amazing discovery. Right away, one photo clearly showed us that the amp with the shifted-mains-legend with George did indeed have a turned Amphenol connector. This raised all sorts of questions – and put paid to any lingering doubt that the Swiss amp was just some kind of mis-drilled experiment. The fine detail of the photos raised other questions too – like the nagging doubt over the question of whether there might have been a ‘fourth amp’. Armed with the new photos, we started to look into this again (we’ll have to come back to the complex issue of the question of a fourth amp & the twisted Amphenol later). This is the background to how we came to be looking, in some detail, at the exact placement of the labels/legends on two back panels. Looking at other marks, you could see there were still differences – one had decades more wear and tear obviously. Gradually though, under the newer markings, more marks matched up with the ones on the panel in 1966. At first we’d been looking at two different amps; as more and more marks matched up though, with a sense of disbelief, the two amps started to merge. It started to look like two photos of the same amp, with the original marks on one of them being overlaid by some new scratches and marks from more than 50 intervening years. We’d started by looking into the possibility of a ‘fourth’ Beatles amp. Now, that path had led us instead to something completely unexpected. It looked like another Beatles amp had been staring us in the face the whole time. The detailed photos we’ll be using for comparisons were sourced direct from the original of this photo. 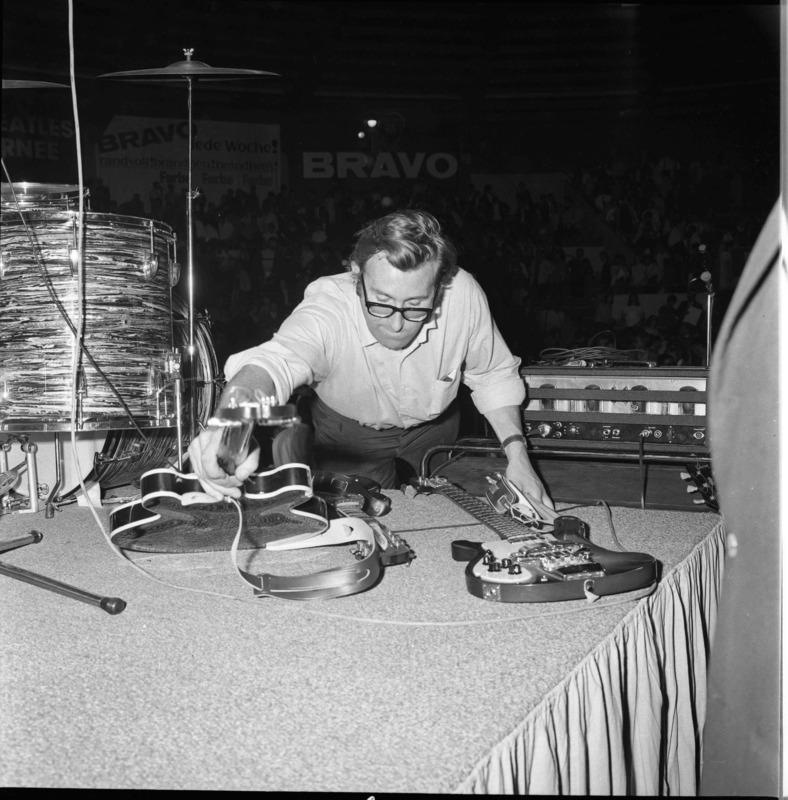 Taken at the Krone-Bau, Munich on June 24th 1966, it shows Mal Evans placing guitars on the right hand corner of the stage, where George’s amp was normally placed. In the following posts we’ll go through details of the Swiss amp, side by side with the amp here – to show why we are now certain that they show the same amp.